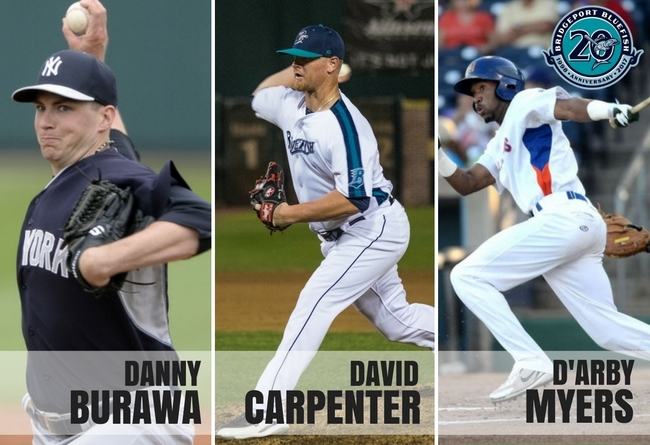 (Bridgeport, Conn., April 6, 2017) – Bridgeport Bluefish team officials have announced that former big league pitcher David Carpenter will return to Bridgeport for the 2017 season. Danny Burawa, also a former big league hurler, and outfielder D’Arby Myers will join the team as well. David Carpenter returns to Bridgeport for his tenth season of professional baseball and second in the Atlantic League. The former Major Leaguer began last season with the ‘Fish before having his contract purchased midseason by the Los Angeles Angels of Anaheim organization. He made 15 appearances with Triple-A Salt Lake before returning to Bridgeport to finish the 2016 campaign. In 36 outings with the Bluefish, he collected a 3.79 ERA with 39 strikeouts and six saves across 35.2 innings of work. The 31-year-old made his professional debut in 2006 after being drafted by the St. Louis Cardinals in the 12th round of the MLB draft. He has five big league campaigns under his belt, with the Houston Astros (’11-’12), Toronto Blue Jays (’12), Atlanta Braves (’13-’14), New York Yankees (’15), and Washington Nationals (’15). In 218 career MLB outings, he owns 11 wins with a 3.92 ERA and 216 strikeouts in 211.1 innings of work. In 240 career minor league appearances, David owns a 15-12 record with a 3.33 ERA and 288 strikeouts in 273.0 innings. Danny Burawa comes to Bridgeport for his seventh season of professional baseball and second in the Atlantic League. Last year, the former big leaguer began the season in the Atlanta Braves organization, playing with Triple-A Gwinnett of the International League and Double-A Mississippi of the Southern League. Midway through the season, he joined Bluefish cross-sound rivals, the Long Island Ducks. In 17.2 innings across 22 games with the Ducks, he collected a 5.09 ERA and struck out 17 batters. The Long Island native began his professional career in 2010 after being drafted by the New York Yankees in the 12th round of the MLB draft. He spent five seasons with the Yankees organization, making his Major League debut in 2015. That same season, he also spent time with the Atlanta Braves big league club. In 13 career MLB games, Burawa struck out 11 batters in 13.0 innings pitched. In 210 career minor league games, Danny owns 18 wins with a 3.74 ERA and 298 strikeouts in 317.2 innings of work. D’Arby Myers joins the Bluefish for his second season in the Atlantic League and 12th of professional baseball. Last year, the outfielder played for Southern Maryland of the Atlantic League, where he played in 102 games and earned a .280 batting average with seven home runs, 44 RBI, 42 runs scored, and 29 stolen bases. Myers began his professional career in 2006 after being drafted by the Philadelphia Phillies in the fourth round of the MLB draft. He spent seven campaigns with the Phillies organization, and has also spent time in the Oakland Athletics and Los Angeles Angels of Anaheim organizations. He reached as high as Triple-A with the Angels, playing for Salt Lake of the Pacific Coast League in 2015. In 797 career minor league games, D’Arby owns a .268 batting average with 30 home runs, 267 RBI, 401 runs scored, and 153 stolen bases.